15 best indoor slides for toddlers you may be interested in! Have you ever thought about bringing your little ones some fun inside your home? Now you can bring it to reality by making an indoor slide for your kids. Children always love soaring down an adorable colorful slide and that usually brings kids developmental benefits. Climbing slowly to the upper of the slide and pushing themselves down the slide will all help develop your child’s developmental skills like balance and coordination. At the end of the slide, the decision they have made about when to put their feet down is a good way to develop the dimensional skills. Through holding on the edges, handlebars, and ladders, the fine-motor skills, as well as the muscle power of kids will develop fast. Considering the safety of your child, you should just allow one child to use the slide at a time. When a child is waiting for his turn, he will learn to be patient and cooperative. Kids can always immerse themselves into the slide, and that will also help them learn many important skills, which are useful for their comprehensive growth. After all, if you are going to buy an indoor slide for kids, then the list of 15 best indoor slides for toddlers and preschoolers may help you make the choice. In this list, you will be able to see slides of different sizes and shapes. Usually, you will find it is pretty hard to keep an active toddler occupied by one simple activity. They are easier to transfer their attention compared to other ones. Taking this into consideration, this kind of slide will meet those active toddlers’ demands. Except for the slide, ball drops, climber hole, a set of stairs are all included in. Still, ten play balls there will enable kids to play in a group. Above all, the space under the climber can make a hide and seek game for toddlers. Parents do not have to worry about the size and the installation. Because this slide is small enough for indoor using, and the installation is also easy and quick. With this slide, your toddlers will hone their group skills and motor skills. 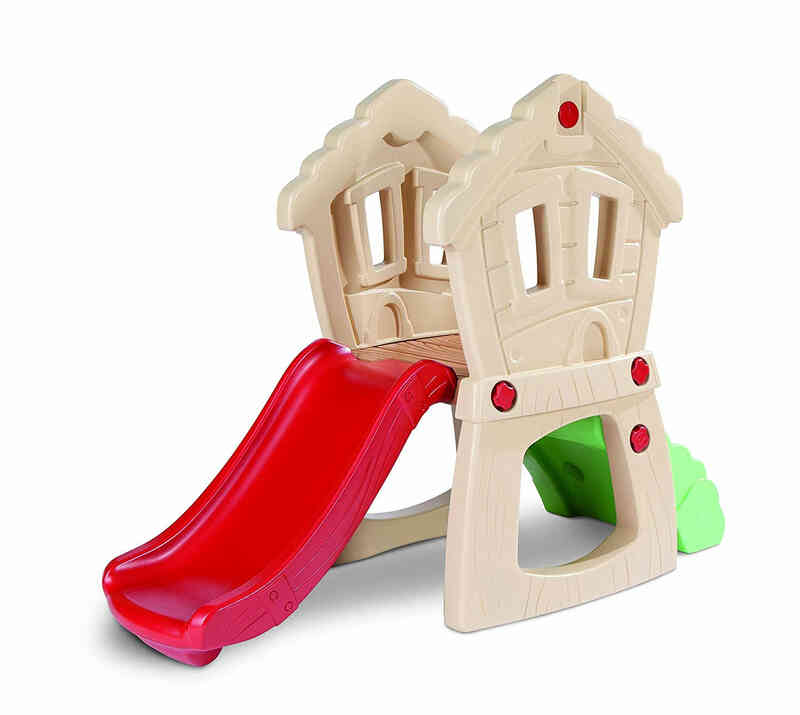 This is a fantastic playset with a cute slide and kids will soon fall into love with it. Except for the slide, you can still see the platform area, an optional sandbox, two spinning wheels, and two rock wall climbing slides. As the child starts to play, the sandbox area can offer them a wonderful place to put their favorite stuff, or they can even hide there. For most of the household rooms, such as the child’ room, basement, den, living room, the natural color combined with the practical textures will suit very well. The quality construction and sturdy design will enable your baby to have fun for a long time. With the attachment of easy-to-follow instructions, parents can install the slide quickly. Kids of eight years old are the best candidates, but babies can still have their fun with parents’ supervision. Because of the multifunction of this slide, kids will have a lot to explore and the exploration will help them to become a more imaginative kid. Kids can play in all kinds of scenarios and scenes with all of these presented items. In this robust tree house, toddlers can enjoy their time both inside or outside. For very young kids, this playset can be placed on an indoor soft surface. This tree house includes an elevated lookout platform, ladder, slide, and a hide-way underneath. Also, kids can hide, store their toys in the open area underneath. The roof of this treehouse looks like a real rough roof with an amazing layered shingle pattern. When kids begin the pretend play, they can use the big, bright, yellow periscope attached with the roof to see around in 180 degrees. Kids from eight months to five-years-old can reap lots of fun and profits from this playset. Adults’ supervision will help to make the highest level of safety when the kids are playing in this tree house. In such a versatile design, kids can improve their hand-eye coordination, balance, imagination, muscle strength, and motor ability. The indoor slide for toddlers will bring your little one lots of fun either. Compared to outdoor slide, the indoor slide will also equal fun and profits for your little ones. On those rainy days or super-hot days, indoor play sets can provide kids with continuous excitement and mitigate boredom. Indoor play is also considered much safer with adult’ supervision in place. 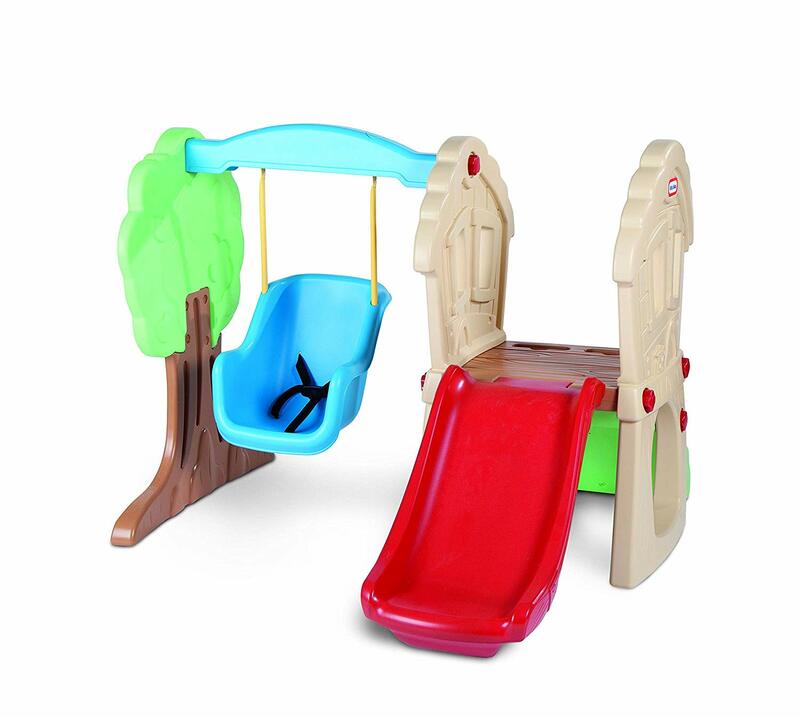 The Woodland Climber is a perfect play set for babies and toddlers. Also, kids from one to five-years-old will like this activity assortment. Woodland Climber includes two steering wheels, a platform play area, two rock climbing sides, a slide, and all of these cater to kids of different ages. Even more, the bottom space of this play set will provide a sheltered place for kids to store their toys or play the hide and seek game. This kind of indoor slide designed with practical textures and soft colors will blend in with all kinds of house decoration. 240 pounds is the maximum load of the climber, so it is better to let one child play at a time. This indoor slide will be easy to assemble with the instructions attached, and the fantastic durability of the activity set can last a long time. With those extensive activities to play, kids’ talents can become perfected. Those developmental skills, for example, coordination, balance, muscle strength, gross motor, and imagination will be inspired deeply. 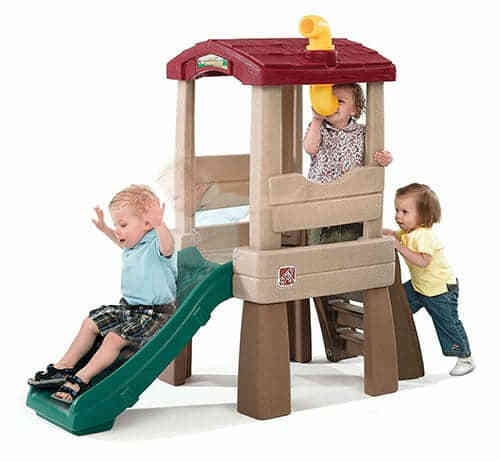 This indoor slide is a four-in-one playset, which will entertain your toddlers for hours until their feeling of tired. Those beginners can climb up the well-designed easy climbing wall. For most of the kids, they can do a lot, for example, slip fast down the slide, crawl slowly through the tunnel, and inspect surroundings carefully from the platform. Toddlers and babies can choose to look out through the windows installed on each side of the platform, also, they can hide out under a slide set. This kind of indoor slide has its magic power to draw on those kids’ attention who are not easily entertained. Plenty of activities can benefit your toddlers in balance, fine motor skills. Even more, the related group activity can teach your child to share their precious stuff with their friends. You can find a cute bright red slide, as well as an adorable blue swing from this indoor slide. With this playset, a child can reap a lot of joy and benefits. A miniature rock wall leads to the upper of the ladder, in that way, the beginners can take an adventure climbing the rock wall to the top. Plus, kids will have enough room to slip down with the help of a wide slide. It tilts smoothly so that your toddlers can land very softly at the bottom of the slide. About the swing, babies can safely enjoy the thrill with the closure safety belt. The charming points about this indoor slide and swing are the side pieces, which provide support for the activities. The side of the indoor slide looks like a clubhouse with two windows aside. The size of the slide and the swing is just suitable for babies, so they can easily learn to slide and swing in the early time. Also, the proper height of the slide can help kids to play in a peaceful mind. The Junior Play Slide can teach those littlest of children to slide down the slide, climb the steps, and crawl underneath. The appearance of bold colors will successfully attract a child’s attention while they are playing with this indoor slide. Boys and girls can all perform well in this kind of activity. Also, babies have to keep healthy both internal and external through activities. This kind of small indoor slide will provide productive play for kids and encourage an active, healthy lifestyle for them. 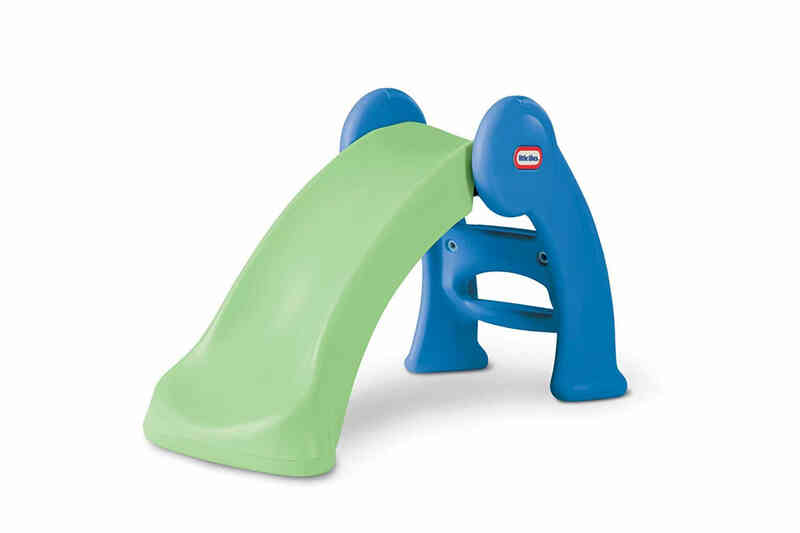 The wide base of the slide can guarantee safety because it is hard to topple over. For assembly, parents can get it done without any tools, and the toy folds away easily which is quite convenient for storage and travel. This Junior Play Slide can help develop your child’s talents of balance, coordination, and gross motor abilities. Especially, the size is so suitable that your child can play with it easily. The Step 2 All Star Sports Climber could be a fantastic indoor play slide for toddlers and its size is quite their size. Toddlers have to climb up a small rock wall to reach the top of the slide, instead of an ordinary ladder. No harm will happen to your little ones because the rock wall is well-designed for little kids. When babies want a break from the slide, they can play the basketball with the basketball hoop seen in the bright yellow side, as well as the football with the hole in the bright red side. These balls are included with the playset, and the balls are inflatable. With this indoor slide set, you little ones always keep their choice to decide which activity they want to join in. The colorful pieces of the playset will help your child become professional at fine-motor, hand-eye coordination, and spatial awareness. Besides these benefits this indoor slide can bring to your child, the playset is also lightweight, which is convenient for the moving. Above all, the plastic material of this set will save your cleaning time. The Step 2 Naturally Playful Slide with a short slide could be the first choice for a tiny space. The ladder designed with sure-grip handles and high side rails will guarantee your child’s safety during the climbing. The slide coated with resin will be durable enough to survive natural elements. Kids between the ages of 2 and 5 will enjoy their happy moment on the ladder and the slide. This indoor slide can fold into itself, and that will help a lot for storing and transporting. The material of high-grade plastic makes this slide more durable and easier to clean. The solid and stable platform will ensure the slide won’t tip over while your child is sliding or climbing. This indoor slide looks like a lady’s high heels but this “heel” is gently tilted outwards. Nevertheless, the design has offered optimum stability. The steps of the ladder are completely wide and the slide is not like the characteristic S-shape of other Step 2 products. The unique part of continuity allows children to stop gently at the bottom of the slide, and that will make a great safety. The play and fold, just like its name, it is fully foldable for daily use. The foldable ability makes it very convenient for storage and transportation in instances there is a coming family trip. The Play and Fold is surprisingly wide for another adding to its superb stability. This kind of indoor slide will be a good choice for toddlers, who are just starting to climb. The large steps of this slide allow an easier climb for the toddlers and surely guarantee their safety. Such toys like toy car can be used to drop down the slide as a preview, in case of the little kids are not yet ready to do it themselves. The Little Tikes Red First Slide is even simpler for kids when compared to the Step 2 Play & Fold Slide. The weight of this indoor slide is only 9 pounds, and its price is cheaper than $40 while it folds into itself easily for storage. That being said, you can assume this slide is made from flimsy plastic at your first glimpse. Nonetheless, the slide is still durable for long-term use. Before allowing your kids to climb up or slide down, you should make sure you have assembled the slide correctly in corresponding with the instructions. Especially the handles, you may need to confirm the handles snap into the slide in the right way. Even more, the material of this slide is sturdy and high-quality, and that will also make a safer environment for your little ones. This indoor slide will actually attract a wide range of kids due to its accessibility for younger kids. The slide, climbing gym, together with a cute little basketball hoop, all exist in this playset. It is the best choice for multiple toddlers to play it at the same time. Due to its multifunction design, kids can share the single indoor slide with their twins or friends just for the common fun. Unfortunately, you may not be able to store it because it isn’t foldable. Although its inability for storage, its size is just suited for a little bit more space. This slide is just perfect for younger toddlers. For those older ones, you may have to weigh it down with a sandbag before they start to play. If you have enough space in your house, you can take this slide into your consideration. It is a little bulkier than other slides due to the extra small climbing gym attached to the side. It is approximately 3 feet tall and 4 feet wide. However, it may take you lots of time to fold down it. Because of its extra weight, this kind of slide is more stable and durable than those little ones. Even those big kids can get rough with this slide. There is a big opening underneath under the climbing gym, which is perfect for the hideout or play. Whether you have younger or older toddlers, this indoor slide could be a good choice. The pirate theme can always create an exhilarating experience for little kids. The captain’s map, the climbing gym, and the red helm together make this play set a ship appearance. Kids can spend plenty of time on pretending to sail around the world as a pirate. 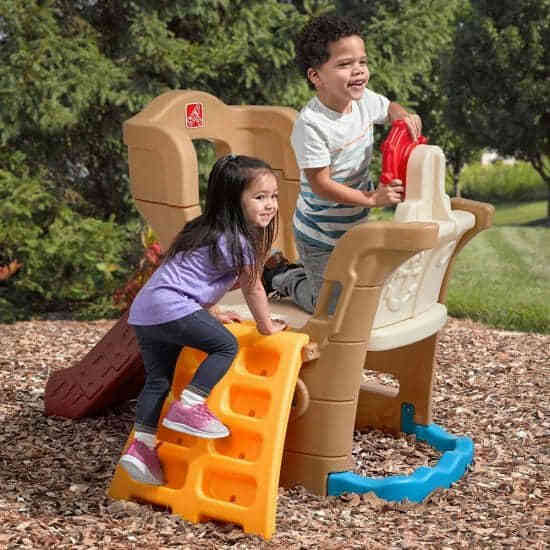 The “pirates” will not be alone looking for treasure, because this climber set is very sturdy for multiple kids to play on it at a time. The real slide is a little bit short, which may fail to provide a sliding for kids over 6-year-old. The oh-so-adorable arch is not big enough for many older toddlers, and it will be soon removed after purchasing. The “3-in-1” playset includes a mini ball pit, a ball-throwing target, and a small slide. its main structure consists of durable plastic tubes. In fact, ball pit can always generate hours of fun for the toddlers because of its colorful appearance. The slide of this indoor play set is short, so kids older than 3 may not get the expected fun. You can receive 50 balls together with the slide. 50 balls may sound like a lot, but this is not enough for the pit. But you can buy some extra balls to fill the pit fully. Overall, the price, size, safety and many related issues are all the things parents will take into their consideration. Hope you can find the indoor slide just suit well for your house. This entry was posted in blog and tagged indoor playground equipment.